Productivity of marine fish stocks is known to be affected by environmental and ecological drivers, and global climate change is anticipated to alter recruitment success of many stocks. While the direct effects of environmental drivers on fish early life stage survival can be quantified experimentally, indirect effects in marine ecosystems and the role of adaptation are still highly uncertain. We developed an integrative model for the effects of ocean warming and acidification on the early life stages of Atlantic cod in the Barents Sea, termed SCREI (Simulator of Cod Recruitment under Environmental Influences). Experimental results on temperature and CO2 effects on egg fertilization, egg and larval survival and development times are incorporated. Calibration using empirical time series of egg production, temperature, food and predator abundance reproduces age-0 recruitment over three decades. We project trajectories of recruitment success under different scenarios and quantify confidence limits based on variation in experiments. A publicly accessible web version of the SCREI model can be run under www.oceanchange.uni-bremen.de/SCREI. Severe reductions in average age-0 recruitment success of Barents Sea cod are projected under uncompensated warming and acidification towards the middle to end of this century. Although high population stochasticity was found, considerable rates of evolutionary adaptation to acidification and shifts in organismal thermal windows would be needed to buffer impacts on recruitment. While increases in food availability may mitigate short-term impacts, an increase in egg production achieved by stock management could provide more long-term safety for cod recruitment success. The SCREI model provides a novel integration of multiple driver effects in different life stages and enables an estimation of uncertainty associated with inter-individual and ecological variation. The model thus helps to advance towards an improved empirical foundation for quantifying climate change impacts on marine fish recruitment, relevant for ecosystem-based assessments of marine systems under climate change. Using the outputs of projections under the highest emission scenario of the representative concentration pathways performed by Earth system models (ESMs), we evaluate the ocean acidification rates of subsurface layers of the western North Pacific, where the strongest sink of atmospheric CO2 is found in the mid-latitudes. The low potential vorticity water mass called the North Pacific Subtropical Mode Water (STMW) shows large dissolved inorganic carbon (DIC) concentration increase, and is advected southwestward, so that, in the sea to the south of Japan, DIC concentration increases and ocean acidification occurs faster than in adjacent regions. In the STMW of the Izu-Ogasawara region, the ocean acidification occurs with a pH decrease of ~0.004 year−1 , a much higher rate than the previously estimated global average (0.0023 year−1), so that the pH decreases by 0.3–0.4 during the twenty-first century and the saturation state of calcite (ΩCa) decreases from ~4.8 down to ~2.4. We find that the ESMs with a deeper mixed layer in the Kuroshio Extension region show a larger increase in DIC concentration within the Izu-Ogasawara region and within the Ryukyu Islands region. Comparing model results with the mixed layer depth obtained from the Argo dataset, we estimate that DIC concentration at a depth of ~200 m increases by 1.4–1.6 μmol kg−1 year−1 in the Izu-Ogasawara region and by 1.1–1.4 μmol kg−1 year−1 in the Ryukyu Islands region toward the end of this century. As atmospheric CO₂ concentrations rise, associated ocean warming (OW) and ocean acidification (OA) are predicted to cause declines in reef-building corals globally, shifting reefs from coral-dominated systems to those dominated by less sensitive species. Sponges are important structural and functional components of coral reef ecosystems, but despite increasing field-based evidence that sponges may be ‘winners’ in response to environmental degradation, our understanding of how they respond to the combined effects of OW and OA is limited. This PhD thesis explores the response of four abundant Great Barrier Reef species – the phototrophic Carteriospongia foliascens and Cymbastela coralliophila and the heterotrophic Stylissa flabelliformis and Rhopaloeides odorabile to OW and OA levels predicted for 2100, under two CO₂ Representative Concentration Pathways (RCPs). The overall aim of this research is to bridge gaps in our understanding of how these important coral reef organisms will respond to projected climate change, to begin to explore whether a sponge dominated state is a possible future trajectory for coral reefs. To determine the tolerance of adult sponges to climate change, these four species were exposed to OW and OA in the Australian Institute of Marine Science’s (AIMS) National Sea Simulator (SeaSim) in a 3-month experimental study. The first data chapter explores the physiological responses of these sponges to OW and OA to gain a broad understanding of sponge holobiont survival and functioning under these conditions. In this chapter I also address the hypothesis that phototrophic and heterotrophic sponges will exhibit differential responses to climate change. In the second and third data chapters I explore the cellular lipid and fatty acid composition of sponges, and how these biochemical constituents vary with OW and OA. Lipids and fatty acids are not only vital energy stores, they form the major components of cell membranes, and the structure and composition of these biochemical constituents ultimately determines the integrity and physiological competency of a cell. Therefore through these analyses I aimed to determine how OW and OA affects the metabolic balance of sponges, and to understand mechanisms underpinning observed systemic sponge responses. Finally, to provide greater insight into the population level impacts of climate change on tropical sponges, in the last data chapter I explore the response of the phototrophic species Carteriospongia foliascens to OW/OA throughout its developmental stages. I found that while sponges can generally tolerate climate change scenarios predicted under the RCP6.0 conditions for 2100 (30ºC/ pH 7.8), environmental projections for the end of this century under the RCP8.5 (31.5ºC/ pH 7.6) will have significant implications for their survival. Temperature effects were much stronger than OA effects for all species; however, phototrophic and heterotrophic species responded differently to OA. Elevated pCO₂ exacerbated temperature stress in heterotrophic sponges but somewhat ameliorated thermal stress in phototrophic species. Furthermore, sponges with siliceous spiculated skeletons resisted the RCP 8.5 conditions for longer than the aspiculate species. Biochemical analysis revealed that spiculated species also have greater cell membrane support features, which is likely to contribute to the observed stress tolerance. I also found that the additional energy available to phototrophic sponges under OA conditions may be used for investment into cell membrane support, providing protection against thermal stress. Finally, larval survival and settlement success of C. foliascens was unaffected by OW and OA treatments, and juvenile sponges exhibited greater tolerance than their adult counterparts, again with evidence that OA reduces OW stress for some of these life stages. Based on the species studied here, this thesis confirms that sponges are better able to deal with OW and OA levels predicted for 2100 under RCP6.0, compared to many corals for which survival in a high CO₂ world requires OW to remain below 1.5°C. This suggests sponges may be future ‘winners’ on coral reefs under global climate change. However, if CO₂ atm concentrations reach levels predicted under RCP8.5, the prognosis for sponge survival by the end of this century changes as inter-species sponge tolerances to OW and OA differ. Under this projection it is likely we will also start to see a shift in sponge populations to those dominated by phototrophic sponges with siliceous spiculated skeletons. Overall, this thesis gives a holistic view of OW and OA impacts on tropical sponges and provides the basis from which to explore the potential for a sponge-coral regime shift in a high CO₂ world. Future oceanic conditions induced by anthropogenic greenhouse gas emissions include warming, acidification and reduced nutrient supply due to increased stratification. Some parts of the Southern Ocean are expected to show rapid changes, especially for carbonate mineral saturation. Here we compare the physiological response of the model coccolithophore Emiliania huxleyi (strain EHSO 5.14, originating from 50oS, 149oE) with pH/CO2 gradients (mimicking ocean acidification ranging from 1 to 4 × current pCO2 levels) under nutrient-limited (nitrogen and phosphorus) and -replete conditions. Both nutrient limitations decreased per cell photosynthesis (particulate organic carbon (POC) production) and calcification (particulate inorganic carbon (PIC) production) rates for all pCO2 levels, with more than 50% reductions under nitrogen limitation. These impacts, however, became indistinguishable from nutrient-replete conditions when normalized to cell volume. Calcification decreased three-fold and linearly with increasing pCO2 under all nutrient conditions, and was accompanied by a smaller ~30% nonlinear reduction in POC production, manifested mainly above 3 × current pCO2. Our results suggest that normalization to cell volume allows the major impacts of nutrient limitation (changed cell sizes and reduced PIC and POC production rates) to be treated independently of the major impacts of increasing pCO2 and, additionally, stresses the importance of including cell volume measurements to the toolbox of standard physiological analysis of coccolithophores in field and laboratory studies. The anthropogenic increase in atmospheric CO2 that drives global warming and ocean acidification raises serious concerns regarding the future of corals, the main carbonate biomineralizers. Here we used transcriptome analysis to study the effect of long-term gradual temperature increase (annual rate), combined with lowered pH values, on a sub-tropical Red Sea coral, Stylophora pistillata, and on a temperate Mediterranean symbiotic coral Balanophyllia europaea. The gene expression profiles revealed a strong effect of both temperature increase and pH decrease implying for synergism response. The temperate coral, exposed to a twice as high range of seasonal temperature fluctuations than the Red Sea species, faced stress more effectively. The compensatory strategy for coping apparently involves deviating cellular resources into a massive up-regulation of genes in general, and specifically of genes involved in the generation of metabolic energy. Our results imply that sub-lethal, prolonged exposure to stress can stimulate evolutionary increase in stress resilience. 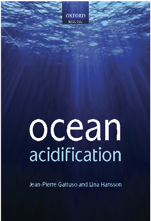 The oceanic uptake of anthropogenic carbon has mitigated climate change, but has also resulted in a global average 0.1 decline in surface ocean pH over 20th century known as ocean acidification. The parallel reduction in carbonate ion concentration ([CO32-]) and the saturation state of seawater (Ω) has caused many major calcium carbonate-secreting organisms such as planktonic foraminifera to exhibit impaired calcification. We develop proxy calibrations and down core records that use calcification and geochemical characteristics of planktonic foraminifera as proxies for the marine carbonate system. This study focuses specifically on the surface ocean chemistry of the California Current Ecosystem (CCE), which has been identified as a region of rapidly progressing ocean acidification due to natural upwelling processes and the low buffering capacity of these waters. The calibration portion of this study uses marine sediments collected by the Santa Barbara Basin (SBB), California sediment-trapping program located in the central region of the CCE. We calibrate the relationships of Globigerina bulloides calcification intensity to [CO3 2-] and the B/Ca ratios of G. bulloides, Neogloboquadrina dutertrei and Neogloboquadrina incompta shells to Ω calcite using in situ measurements and model simulations of these independent variables. By applying these proxy methods to down core, our records from the SBB indicate a 20% reduction in foraminiferal calcification since ~1900, translating to a 35% decline in [CO 32-] in the CCE over this period. 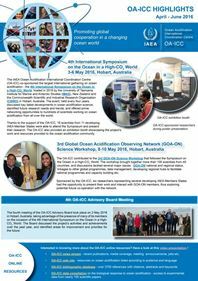 Our high-resolution calcification record also reveals a substantial interannual to decadal modulation of ocean acidification in the CCE related to the sign of Pacific Decadal Oscillation and El Niño Southern Oscillation. In the future we can expect these climatic modes to both enhance and moderate anthropogenic ocean acidification. Based on our historic record, we predict that if atmospheric CO2 reaches 540 ppm by the year 2100 as predicted by a conservative CO3 pathway, [CO32-] will experience a net reduction of 55%, resulting in at least a 30% reduction in calcification of planktonic foraminifera that will likely be mirrored by other adversely affected marine calcifiers. Diatoms are eukaryotic microalgae that are responsible for up to 40% of the ocean’s primary productivity. How diatoms respond to environmental perturbations such as elevated carbon concentrations in the atmosphere is currently poorly understood. We developed a transcriptional regulatory network based on various transcriptome sequencing expression libraries for different environmental responses to gain insight into the marine diatom’s metabolic and regulatory interactions and provide a comprehensive framework of responses to increasing atmospheric carbon levels. This transcriptional regulatory network was integrated with a recently published genome-scale metabolic model of Phaeodactylum tricornutum to explore the connectivity of the regulatory network and shared metabolites. The integrated regulatory and metabolic model revealed highly connected modules within carbon and nitrogen metabolism. P. tricornutum’s response to rising carbon levels was analyzed by using the recent genome-scale metabolic model with cross comparison to experimental manipulations of carbon dioxide. IMPORTANCE: Using a systems biology approach, we studied the response of the marine diatom Phaeodactylum tricornutum to changing atmospheric carbon concentrations on an ocean-wide scale. By integrating an available genome-scale metabolic model and a newly developed transcriptional regulatory network inferred from transcriptome sequencing expression data, we demonstrate that carbon metabolism and nitrogen metabolism are strongly connected and the genes involved are coregulated in this model diatom. These tight regulatory constraints could play a major role during the adaptation of P. tricornutum to increasing carbon levels. The transcriptional regulatory network developed can be further used to study the effects of different environmental perturbations on P. tricornutum’s metabolism.